Happy Monday! I hope you had a great weekend and are ready for a new week. My weekend was great, especially with a new toy I purchased. With our upcoming move in the heart of downtown Chicago, we originally planned on selling our car and relying on public transportation. When we went to the dealership to get an appraisal and sell it, my husband noticed that the car I've been coveting for years happened to be on their lot. It had all the bells and whistles I wanted (which is hard to come by) so we ended trading the car instead! 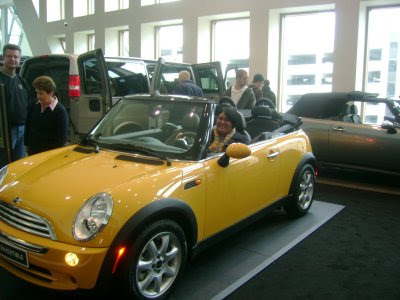 I fell completely in love and purchased a black 2006 Mini Cooper S. For years thath I've been attending auto shows, I've always made it a point to get into one and have a picture taken. I'm still in shock that I have one now! And this is me in 2009 with the keys to my new car! Congrats! So exciting to get the car you've always dreamed of. Have a blast! Congrats on the new car! Its so cute! Wow, it must've been fate! You look great it in! You and the car, you IN the car, look great together! Congratulations! Va-va-roooooooooooomm!!!!! You go girl in your new pimpity ride!!! 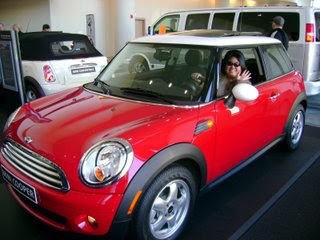 I love how you pics from the past 2 years, you definitely had it in the making to be a mini owner!!! How fun! Congrats on the new car! I am glad you finally got the car you have been coveting! It's super cute and you look awesome in it. Enjoy!